Holy guacamole. We’ve got lots of yummy eats and even yummier style pics in this post! Let’s get at it. 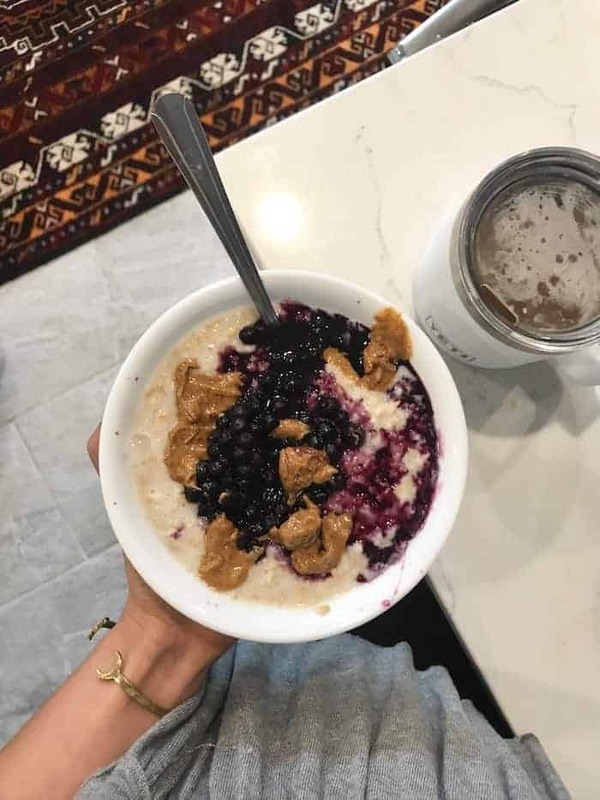 Breakfast was my go-to warmed Overnight Steel Cut Oatmeal with microwaved frozen wild blueberries and Costco’s drippy almond butter. Coffee in my Yeti mug. I had a nutrition appointment mid morning with a client at Fox in the Snow where we shared a scrumptious sticky bun and coffee. Lunch was a TRISM mish mash again. I haven’t been cooking lunch food because I’m spending so much time at the restaurants where there’s always plenty to eat. In this bowl was maple tamari tofu, black rice, sweet potatoes and carrots, chipotle sweet potato hummus, banana peppers, cornbread croutons, herbed tahini…AKA the Soul Bowl with my own twist! We’re currently reworking the menu so keep your eyes peeled for some exciting changes. Snackage included the biggest, juiciest organic honey crisp apple while shopping at Trader Joe’s. I got some sunbutter to drizzle over top the next time I have one and I can’t freakin’ wait. Best combo! Dinner was this Vegan Mexican Cheesy Tortilla Bake with a couple twists. I added a layer of sautéed onion, kale, and red pepper and then used 3/4 cup tofu + 1 tbsp apple cider vinegar in the sauce rather than the yogurt. Jeff and I loved this drizzled with TJ’s green dragon hot sauce! I made a big salad on the side with greens, tomatoes, carrots, and cucumbers plus CHEVOO’s epic chili lime goat cheese, which was totally the star. For the dressing, I blended olive oil, red wine vinegar, dijon, oregano, maple syrup, salt, pepper, garlic, and a splash of water in the Nutribullet. The emulsification makes it amazingly creamy! Dessert was a couple chocolate covered pumpkin oatmeal bites modified from this recipe. I’ll be posting the recipe soon! Striped v neck (only $14.97, size down), my favorite shorts (on sale for half off, the only shorts I wear!! ), the best black hat (also obsessed with this one in camel), gladiator sandals. Cami, vegan leather jacket, cutest ruffle mules, and the raw hem black jeans you know I wear like daily. Ruffle mules again with this comfy dress (runs VERY large), and the BEST SOFTEST CARDIGAN IN THE WORLD! Cardigan again with gray peplum tee, distressed jeans, slip ons, backpack (similar). Tie-front button up (on clearance for 50% off, more colors and sizes here), black high-waisted leggings, the comfiest slip ons, baseball hat, gold hoops, bucket bag. LOVE YOU ALL DEARLY and hope you have a rad week! I couldn’t get past “chipotle sweet potato hummus”! Please share that recipe!!?? *whines* But Alex, we’re you’re bestest friends! Can’t you sure with your girls? C’mon, don’t be shy! ? Kidding, girl. Love you to the moon and back. I love your hair half up! Everything as always sounds delicious and you look amazing in everything you wear! You’re so sweet thank you SO much! the amazing article shared by the author. Keep posting like this. The food and clothe you’ve shown on this article are really nice.